Play with the dolphins in this fascinating and lively maritime 3D-adventure! 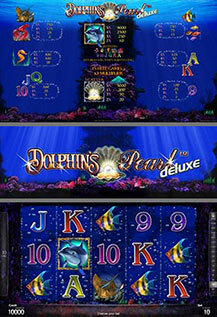 "Dolphin’s Pearl™ deluxe" is an exciting 5-line, 5-reel version of AGI’s legendary video game classic. With brand new high resolution 3D graphics in sub-aqua style and entrancing new sound it will thrill old fans and new players alike! DOLPHIN substitutes for all symbols except scatter and doubles the win when substituting. 3, 4 or 5 scattered PEARLS trigger 15 Feature games. Feature games’ wins are multiplied by 3. Feature games can be won again during the Feature games and are played at current bet.